Recommended Citation: Balazs, B and B A White. Elements of Technology and Success in Virtual Teams. In The Proceedings of the Conference on Information Systems Applied Research 2009, v 2 (Washington DC): §3733. ISSN: 0000-0000. Virtual teams are the future and the future is now! Virtual teams are receiving high attention because they constitute new way of working. Characteristics of virtual teams, such as the maturity curve, the advantages and disadvantages are presented, along with the basic rules to follow in building successful virtual teams. The technologies involved in virtual teams are also presented. Teams are more likely to be effective when certain enabling conditions exist. Shared understanding, easy communication, integration and mutual trust are some of the main conditions. 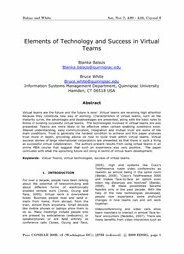 Trust is generally the hardest condition to achieve and this paper analyzes trust more in depth, providing advice on how to build trust within virtual teams. Virtual success stories of large international corporations are presented as that there is such a thing as successful virtual collaboration. The authors present results from using virtual teams in an online MBA course that suggest that such an experience was very positive. The paper concludes with what the upcoming future will bring in terms of virtual team development.